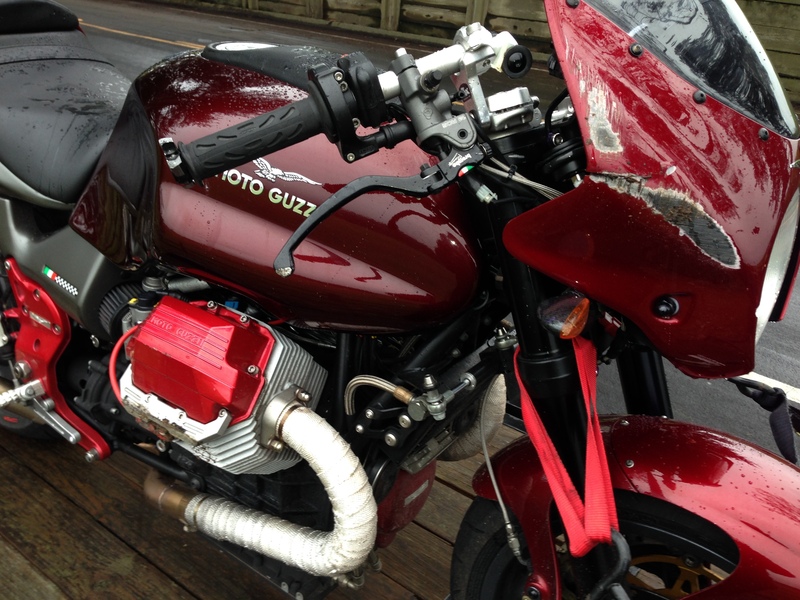 On March 5, Rich low-sided his Moto Guzzi on a stretch of damp eucalyptus-oily road near Tomales and fractured his pelvis in three places. He spent three days in the hospital and the next 8 weeks in a hospital bed at home with strict orders not to bear any weight on the affected side. He knew full well what was at stake if non-compliance led to delayed healing, so he followed those orders to the letter. His only activities during that time were transferring to the wheelchair to get to the bathroom, and doing the in-bed exercises given to him by the home physical therapist. His patience and compliance paid off and he was back on his feet by the beginning of May (and back in the saddle by May 18). But he couldn’t recover for the lost time when he should have been finishing up the bodywork and forks for the bike. He was up and about in time for the June date when the bike was loaded onto the shipping container at the Port of Oakland (along with several other bikes from Team USA) for the trip across the Atlantic Ocean, but the bulky body work and heavy race forks weren’t included in the container. They would have to get there a different (and far more expensive) way. On June 15, Wade and Rich made their non-refundable airplane reservations for the round trip. Less than a week later, we got word that Wade had been hit by a pick-up truck on the streets of San Francisco and pitched off his bike, suffering a concussion, fractures in his back, and a broken ankle and foot. The date of the accident was exactly 8 weeks before they were scheduled to fly. The shipping dilemma caused by Rich’s accident was easily mitigated (or so we thought) by throwing money at a solution. But Wade’s injuries put the whole adventure at risk. Could he recover in time? How would he tolerate a 19-hour flight? Would he be able to ride, let alone race? Given the timing and his doctor’s orders, they wouldn’t even know until they got there and tried. Rich gave him the stern lecture about compliance (based on his own experience and success), and Wade reluctantly agreed to follow his doctor’s orders regarding weight-bearing. And at this point, my good friend Sarah, who specializes in rehab (both human and canine), stepped in to help. Using Rich as her human subject, we recorded a series of videos with a progression of exercises for Wade to follow as soon as he was cleared by his doctor to begin therapy. In theory, it was great news that the injury was to his right foot – all it had to do was to tolerate a race boot, stay on the foot peg, and maybe brake from time to time (most of the braking is done by the right hand). Had it been his left foot (which works the shifter), there would have been greater cause for concern. But here’s the kicker: this isn’t just any ordinary race. There are several places on the Isle of Man course where the rider and bike are airborne, and BOTH feet are critical in the success of the landing. This was the thought that kept them both awake at night as they prepared for their departure. Our heroes were determined to overcome all of the odds and prevail, and things were looking pretty good, all things considered. On July 28, Rich worked closely with The UPS Store in Santa Rosa to carefully pack and air-freight the bodywork (at considerable personal expense). He and the proprietor had long discussions about the fact that these items were not for resale or other commercial use, and were only for personal use in conjunction with a race bike that was already there. The UPS Store owner assured him that (a) the parcels would be there well before he and Wade arrived on August 16, and (b) they would not be assessed VAT/Duty/whatever it is. Off went the three large boxes (to the tune of about $1000). On August 4, Rich was notified that the parcels were stuck at UK Customs, and had been assessed a $1000 duty charge. For the next week, the store owner insisted he could fix the problem but he failed miserably. He eventually conceded defeat on August 13 and recommended Rich just pay the fee and try to recover it later. We paid it, and sent word to our hostess on the Isle (Ros) to pick up the parcels. Late Thursday night, as Rich was preparing to leave for the airport, we received an urgent distress message from Ros that the parcels were no longer on the island. They had been returned to the UK in anticipation of returning them home for non-payment of the tax. 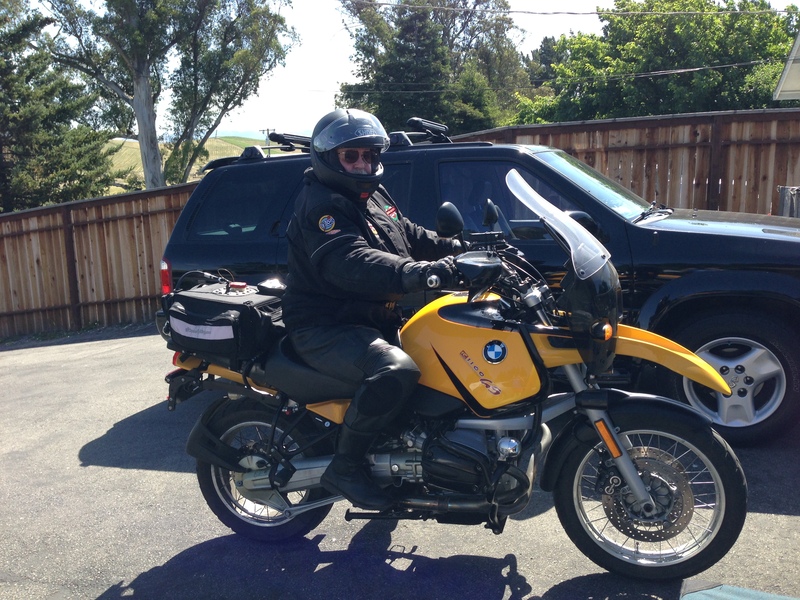 So at 7:30am on Friday, as Rich and Wade took off from SFO headed to the Isle of Man, try to imagine their state of mind: for Wade, the trip itself is old hat – he’s raced there for nearly 20 years. For Rich, going to the Isle of Man is the dream of a lifetime. They have both overcome significant setbacks from recent injuries and have accepted the resultant uncertainties. But thanks to the epic failure of The UPS Store, the uncertainty has been raised to a new level and is beyond their control – they already know they are arriving to a bike that can’t be raced because it doesn’t have body work or forks, and they don’t yet know if Wade’s foot and ankle have healed enough to race. Hard to avoid the bitter expectation that the whole trip would be for naught. In the meantime, I went directly to The UPS Store on Friday morning and met with the owner. He showed me an email he had received from the UK acknowledging receipt of the money and assuring him delivery would proceed immediately. But neither of realized that “immediately” is a relative term when you’re dealing with the Isle of Man. I got word from Ros that she had been in touch with the agent on the island, and the best possible case for delivery was Tuesday morning. TUESDAY, August 19. Two weeks after the boxes were supposed to have gotten there, three days after Rich and Wade would arrive, and worst of all, well into the third day of mandatory practice (having already missed Saturday and Monday). Regardless of how madly they scrambled to prepare the bike after getting the boxes, there simply wasn’t enough time to pass tech inspection in time for the Tuesday practice session at 7:05pm. The dream seemed to be fading at a precipitous rate. I love the image of the two of them at the airport: Wade has a boot on his right foot, he’s walking with the assistance of a cane, and he’s using a wheelchair for most of the distance runs. Rich is still limping, probably should have been using a cane, and is Wade’s “able-bodied attendant” through security and pre-boarding. They’re both wearing full-leg support hose to avoid blood clots on the long flight, and they are both under strict orders from Sarah to walk the aisles and do their lower leg calisthenics during the flight. As if they didn’t have enough stress, here’s a tidbit I didn’t know until much later: apparently, the Tech Inspection tent is at the top of a 1/4-mile hill, similar in steepness to our driveway (which is manageable but not trivial), and you aren’t allowed to ride the race bikes up the hill. The bikes have to be inspected before every on-track session. Aside from everything else they had to worry about, they had absolutely no idea how they were going to push the Suzuki up the hill once, let alone again and again. When Rich got word on Tuesday morning that the parcels had actually arrived, he showed up to pick them up and was informed that the $1000 duty had not been paid. So he paid it AGAIN. As I write this in May, we’re not done with The UPS Store in Santa Rosa. As I see it, somebody stole $1000, there’s another $1000 that should never have been assessed, and the $1000 it cost to ship the boxes should be refunded because they didn’t manage to get it there as promised. But that’s another story. Meanwhile, back on the island, Rich and Wade and an assortment of ad-hoc volunteers have thrashed through Tuesday in order to have the bike ready for tech inspection and practice on Wednesday. One stand-out in the volunteer is an amazing (and imposingly large) German fellow named Thomas, who has taken on the bulk of the bike-pushing activities. One thing I haven’t mentioned yet is that this bike has never turned a wheel under power, let alone under any sort of race conditions. It went from the bench in Rich’s shop to a dyno at Mammoth Motorsports to a crate in a shipping container to the pits at the Isle of Man. This whole adventure is truly a leap of faith. This entry was posted on Wednesday, February 4th, 2015 at 7:27 pm and is filed under Isle of Man. You can follow any responses to this entry through the RSS 2.0 feed. You can skip to the end and leave a response. Pinging is currently not allowed.